Is it really the last day of 2015? Time really flew by this year, but I am definitely excited fr the ball to drop tonight so we can ring in 2016. I’m normally not one to make “resolutions” because I know I will never stick to them, but this year I have a different feeling. There are many things I want to do with this blog and goals to achieve. Here are some of my reading and blogging goals for the coming year. Goodreads Challenge: This year I am going to shoot for 55 books. That is averaging somewhere between 4 to 5 books a month, which shouldn’t be too hard. Especially during the summer I can normally double those numbers. This goal has a second part, and that is to ACTUALLY LOG MY BOOKS. I am so bad at doing this, so I never really know how many books I have read at the end of the year. Reading Before Bed: This is just a new habit I want to insert into my daily routine. Whether I read for 50 minutes of 5, I just want to get into the habit of reading before bed. It’s much better than starting at some screen, and relaxes the body for sleep. Try to Read Books I Already Own: I have quite a few books in my possession that I haven’t even read yet! I hope that changes in 2016. Reviews! !- I have to have more reviews coming out in 2016. In most cases, I read a book, something gets in way of reviewing, and then I forget what to write about. I am hoping to solve this issue by taking a few note while reading so I already have something written to base my review off of. Consistency and Scheduling- I do not want there to be a week where I post everyday and then nothing for the week after. I know that realistically I can’t post everyday unless I am on break, but I still want a couple of posts in a week. Revamping- I feel that another reason I get into blogging slumps is that I get into the same routine. A Sunday Post, a TTT, a tag, and maybe something original. While I love the features I do, I think I may switch it up every couple of months. On top of that, I want to do some more blog remodelling so I can improve Find Me at the LIbrary. Well that’s that! I feel like none of these are outrageous goals by any means, more just new habits. I am often scared to set reading goals because it pressures me into reading and eventually puts me in a slump. I just want to read! So what are some of your goals for 2016? Do you share any of mine? Is there anyway you think I can improve my blog in 2016 (PLEASE I LOVE FEEDBACK SO I CAN CHANGE)? LEt me know in the comments down below! 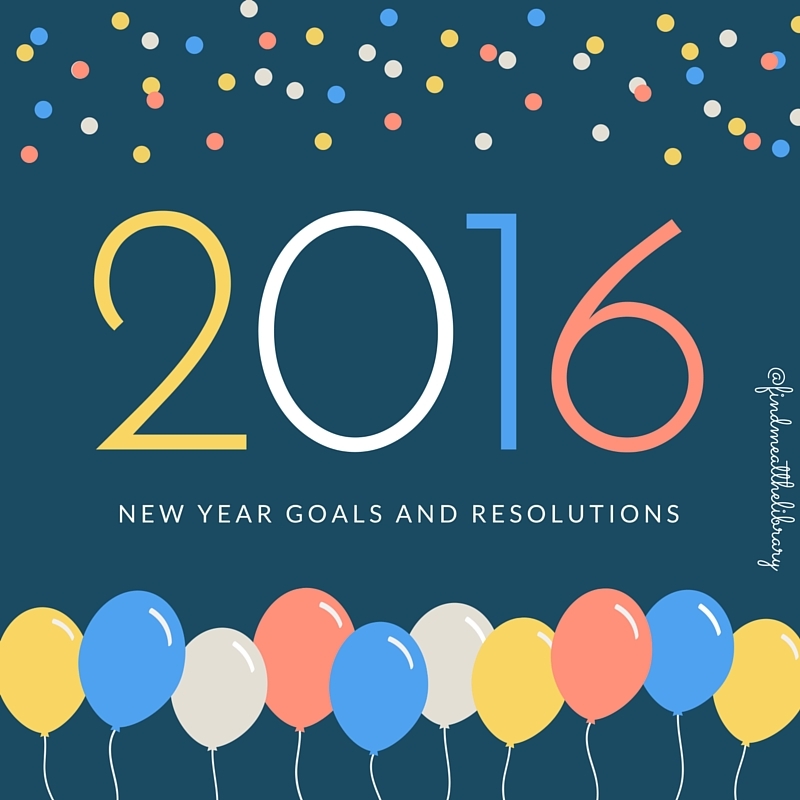 This tag helps you set some little goals for yourself in reading throughout the new year. I hope by at the end of 2015 I can check off a majority of these questions. An author you’d like to read (that you’ve never read before). A book you’d like to read. I would really like to read a Boy in a Striped Pajamas soon. I have it on my shelf but it just never seems like the right time to read something like that. However, it’ll be done this year. A classic you’d like to read. I have never read Jane Eyre, so maybe sometime this year I could get to that. A book you’d like to re-read. The Great Gatsby because I just really want to go through that book again. A book you’ve had for ages and want to read. The Darkest Minds by Alexandra Bracken, because I started it and enjoyed it but other books came out at the same time and it was forgotten. A big book you’d like to read. I don’t really know of any big big books that want to read anytime soon, but I suppose I could always reread one of the last Harry Potter books. An author you’ve previously read and want to read more of. Rainbow Rowell because I have loved the two books of hers that I have read and I would really like to read Attachments and Landline. A book you got for Christmas and would like to read. Well I got the Evolution of Mara Dyer for Christmas so I would like to read that whole trilogy now that I have the first two and the third is out. The Daughter of Smoke and Bone Trilogy or the Grisha trilogy are both high on my lists. Do you set reading goals? If so, how many books do you want to read in 2015? I’m not great at keeping track of the amount of books I read, but this year I may give it a shot. I put 55 on my goodreads, but I am doubtful that I will remember to log my books on there. Just to read more in general. I don’t exactly want more books read, I just want to spend more time reading even if it is just a little at a time.